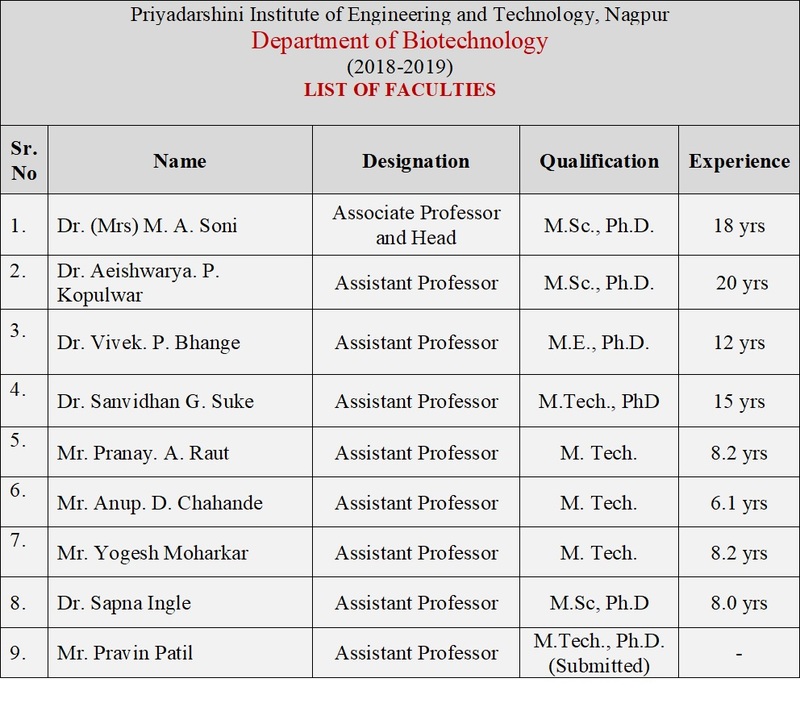 Priyadarshini Institute of Engineering and Technology (PIET) is one of the prestigious engineering institutes run by Lokmanya Tilak Jankalyan Sikshan Sanstha (LTJSS), Nagpur. This is the first institute to offer B. Tech Biotechnology, as four-year semester pattern, degree course, in the entire Vidarbha region. Blessed with spacious and sprawling campus, well designed laboratories, the college and the Department of Biotechnology, aims for academic excellence and all-round development of student in this upcoming field. This course was started in the academic year of 2007-2008 with the intake of 60 students. All India Council of Technical Education (AICTE), New Delhi has granted permission to start this course under Rashtrasant Tukdoji Maharaj Nagpur University, Nagpur. This laid the foundation for B.Tech course structure which was the culmination of engineering and biological sciences. 1. 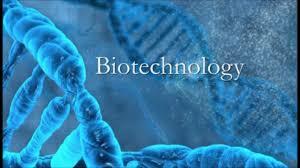 Only institute offering B.Tech course in Biotechnology Discipline. 2. Well equipped lab to conduct research in Molecular Biology, Tissue Culture, Genetic Engineering, Fermentation technology etc. 3. Well qualified and experienced faculty rich in Industrial and Teaching experience. 4. Guest lecturers are invited from eminent personalities in industries and research foundations & workshops in various areas of expertise. 5. Access to Internet for students and staff through 4 Mbps leased line. 6. Effective teaching learning process is implemented by schemes like Class Teacher scheme, continuous assessment of students etc. 7. Students are encourage to undertake training in industries in vacations. 8. A national level Project exhibition & conference - 'NIRMITI' is organized every year jointly by the various departments of PIET. To nurture world-class bioengineers having sound technical knowledge with potential to innovate, invent for the benefit of society, environment by inculcating moral ethical values. To impart strong theoretical and practical background in fundamental concepts of biotechnology. To initiate multidisciplinary programs through academia-industry interface to face the industrial challenges. To train them to adapt new challenges and skilled requirements to develop leadership qualities to make the successful entrepreneur. To demonstrate professional and ethical attitude with enormous responsibility to serve society. Multidimensional consonance to meet the global challenges in Biotechnological frontier. Develop Biotechnology graduates as human resource with technical competencies and strong foundation of basic science and engineering. Able to identify, analyze and solve multidisplinary problems for social cause through team work and ethical attitude. Engage in lifelong learning that will foster their growth as researcher and successful entrepreneur in the field of Biotechnology. An ability to apply knowledge of biological science, and engineering. An ability to design projects as well as to analyze and interpret the data obtained so as to assess the project outcome. An ability to design a system, component, or process to meet desired needs within realistic constraints. An ability to use the techniques, skills, and modern engineering tools necessary for engineering practice with precision and safety. Overall personality development and build-up of entrepreneurship qualities. Demonstrate the strong fundamentals of life science and bioengineering. Analyze and apply advance techniques of biotechnology to address major challenges in health, environment and bioprocess industries. Knowhow on development in biotechnology research by recognizing importance of ethics, management skills and sustainable development. 1. Well-equipped labs for carrying out student projects like molecular biology lab with Thermal cycler and tissue culture lab with growth room. 2. Departmental library and E-library for students to access e-books, previous years university papers. 3. Separate computer (six computers) room where students can access internet for their academic activities. PIET Biotechnology student shines bright at MEDHA – 2017 DhirajPowar, a student offinal year B.Tech Biotechnology at PIET, Nagpur secured 1st prize (Award of Excellence) at the recently concluded event MEDHA – 2017 held at KJ Somaiya College of Engineering, Mumbai. MEDHA – Medical Devices Hackathon is a project model competition organized by BETIC, IIT-Mumbai and KJ Somaiya College of Engineering, Mumbai. The participants were divided into groups and given the task of proposing solutions for any one of the problems faced by surgeons. Dhiraj and his group selected the topic “surgical side infection�? wherein after autoclaving the surgical instruments used by surgeons are placed on a tray. But there are chances of recontamination of the instruments because of the tray. The group made a prototype giving solution to this problem. The prototype “germless tray�? is a surgical tray modified into a container with inbuilt sensors and UV light. This innovative idea of the students has been applauded by one and all at the event. 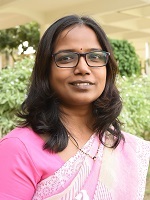 Dr. V. M. Nanoti, Principal PIET; Dr. G.M. AsutkarVice Principal PIET and other staff members of the college congratulated the winning team. Dhiraj gives the credit of his success to his team, family, Principal, Vice-Principal and faculty members of Biotechnology department. The Department of Biotechnology has received grant of Rs 96 Lakhs for carrying out research project on “LUNGS DISEASE OF MINERS OF COAL MINES�? sponsored by CMPDI. 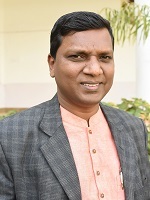 Dr. S. G. Suke (Asst. Prof) is the chief investigator for the project from P.I.E.T. Cadet Sahiba Kaur, student of 3rd Yr, B.Tech Biotechnology, of No. 2 Mah Air Sqn, NCC Grp Ngp, being awarded by honourable Prime Minister Dr. Manmohan Singh for winning ALL INDIA BEST AIR FORCE CADET in PM’s Rally on 28 January, 2014 at Garrison Parade Ground, New Delhi. She participated in the Republic Day Camp from 01 Jan to 29 Jan, and bagged the rare feat of winning PM’s Gold medal for BEST CADET all over India. Saiba Kaur RDC best cadet in SW in Air wing form No.2 (Maharashtra) AIR SQU NCC NGP All India Best Cadet Silver Medal. 2. Bharat SonkusleAkshay Karkare Consolation prize for POSTER PRESENTATION at Perspective 10 P.I.E.T. 6. Abhishek Khapre Selected in VCA ‘panel A’For national cricket tournament “Under 23 domestic league-2011�? A one-week ISTE approved STTP on outcome based teaching learning and assessment process in engineering education for accreditation had been organized in PIET from 13th to 17th December 2016. The event was inaugurated by Dr. Preeti Bajaj, Director, Raisoni group of Institutions and Prof. Prashant Maheshwary, Director JD education society. The event garnered huge response with 92 participants including Principals and Vice-principals of various colleges participating in it. Each day of the one week program saw eminent speakers like Dr. S. B. Bodkhe, Dr. Untawale, Dr. M. B. Chandak and Dr. Vivek Kapur enlightening the participants about Outcome Based Assessment. A health awareness program for all the faculties and students of P.I.E.T was organized by Department of Biotechnology on "How junk is our food" The guest speaker was Dr. Mrs. P. N. Shastri Retd. HOD Food Technology LIT Nagpur. Dr. Shastri explained to the students the difference between “Junk food�? and “Fast Food�? and also how to differentiate them on the basis of their source of calories. INDUSTRIAL VISIT - DINSHAW'S FOOD LTD. The students of 6th semester, Biotechnology Dept. went for an Industrial visit on 20th January 2017 to Dinshaw’s Food Ltd., Ice-Cream Making unit, MIDC Butibori Nagpur. The main Objective behind the visit was to make students aware about how various activities related to production, Quality control, Packaging, Waste management are carried out in company. A group of Students with three faculty members – Mr. Yogesh Moharkar, Mr. Pranay Raut, and Mr. Anup Chahande visited the plant. Students saw various units especially, the Ice-cream making and packing unit. The students were introduced to the different utilities required for making ice cream. On December 22nd and 23rd 2010, two day Conference “BIOCHEMCON-2010�? on various emerging trends in technological advancement in Biotechnology and chemical Engineering was organized by Biotechnology Department in collaboration with Chemical Engineering department. The conference was inaugurated by Dr.B.D.Kulkarni, distinguished scientist NCL Pune. The Guest of honor was Dr.R.B.Mankar Sir, Vice Chancellor of Babasaheb Ambedkar Technological University, Lonere. The conference brought together over 193 professionals from all over country from North to South, to share their experiences, to learn from one another and to debate the future development of intergenerational work. The conference was structured around six topical sessions over two days, each session dedicated to students and faculties separately. These sessions began with Expert talk by various eminent personalities from academia as well as from industry followed by presentations to allow all participants to enter into practical discussion. Technical Sessions for biotechnology witnessed various issues discussed on different topics ranging from application of biotechnology in Medical Science, Nanotechnology, Food Biotechnology, Environmental Biotechnology and agriculture biotechnology. Every year the dept organizes a one-day workshop for students of XII std of various colleges in Nagpur to create an awareness about the stream of B.Tech Biotechnology. A large number of students attend the workshop organized during Nov-Dec of the year. The students’ association of biotechnology – “SYNAPSE�? was inaugurated by the hands of Dr. H. F. Daginawala, a renowned figure in the field of biotechnology with international orientation. The term “SYNAPSE�? itself conveys the meaning that Biotechnology is the culmination of Biology with Technology. Under this banner, the students are encouraged to attend guest lectures, poster competitions and other cultural activities. Every year the forum releases a departmental magazine wherein the students put forward information from reputed science journals and from electronic media in the form of short articles. In 2008, the first departmental magazine was released under the guidance of Dr. Mrs. A.P. Kopulwar. To help students in their preparation for higher studies entrance exam GATE, the department has formed a GATE forum where students conduct a group discussion session, doubt clearing session and solve sample papers prepared by respective subject teachers. Physical distances and the lack of resources make us unable to perform experiments, especially when they involve sophisticated instruments. Also, good teachers are always a scarce resource. Web-based and video-based courses address the issue of teaching to some extent. The ‘Virtual Labs’ project addresses this issue and facilitates the absorption of basic and advanced concepts through internet based experimentation. The Dept of Biotechnology regularly organizes Virtual lab sessions for its students on various subjects in the curriculum of the course. 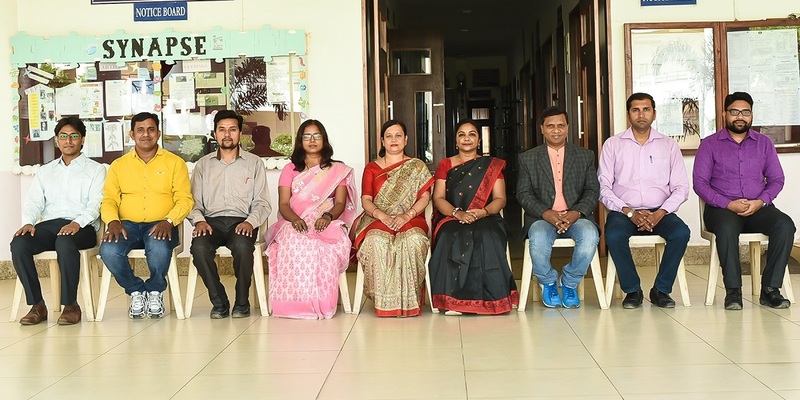 Although the faculty members are available for any queries during working hours on all days a Parents-Teacher meet is organized in every session to keep the parents updated about the progress of the student. Guest Lecture by Dr. Prashant Sakharkar Roosevelt University, USA on topic "Emerging trends in Biotechnology/Pharmaceutical industry and Pharmacoeconomics" Friday 27th July, 2018 in the Seminar Hall PIET.